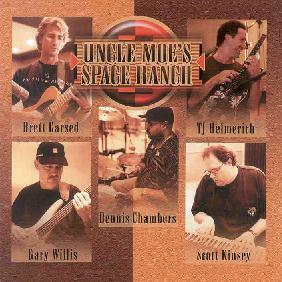 Uncle Moe's Space Ranch - "S/T"
While Uncle Moe's Space Ranch is definitely a fusion group, their music complete with complex arrangements and blazing instrumental wizardry, they differentiate themselves from many other fusion bands by distancing themselves far from their 70's forefathers. There's a very modern sound to this music, which draws heavy influences from electronica, but never makes the mistake of trying to crossover too far into that genre. This is the ultimate fusion of jazz, rock, and electronic music, and also includes some wildly experimental passages that border on industrial. The band is essentially a super-session, with drummer Dennis Chambers of Niacin (and many other projects), bassist Garry Willis and keyboardist Scott Kinsey from Tribal Tech, as well as noted guitarists Brett Garsed and TJ Helmerich. The album features just over an hour of scorching music. Favorite tracks of mine included tjhelmerich@earthlink.net, which is not only a strange title for a piece of music (I presume it's the e-mail address of TJ Helmerich), it's also one of the strangest tracks on the album, with exotic, eastern sounding voice samples and some truly freaked out stop and start soloing. SighBorg, as the title might suggest, has the most overt electronica influences. It's crazy synthesizer freakouts and machine inspired rhythms will have space rock fans drooling. He's Having All That's His To Be Had is both funky and mellow, but also gets spacey and experimental in parts. This band definitely doesn't what their pieces pigeonholed. Minx is the most straightforward fusion rocker on the album, and features some bluesy guitar-work and the most melodic moments of the album. If you got tired of fusion a long time ago, as I sort of did, this album may just re-ignite your interest in it. Truly innovative and exciting! Contact via snail mail c/o Tone Center; PO Box P: Novato, CA 94948.